I celebrated my 26th birthday on the 28th. Yes, I finally started growing. I was stuck at 25 for quite a while. After a point, you have no choice but to accept your age. Gracefully. So let it be with Kamal. So, I went to sleep the previous night. 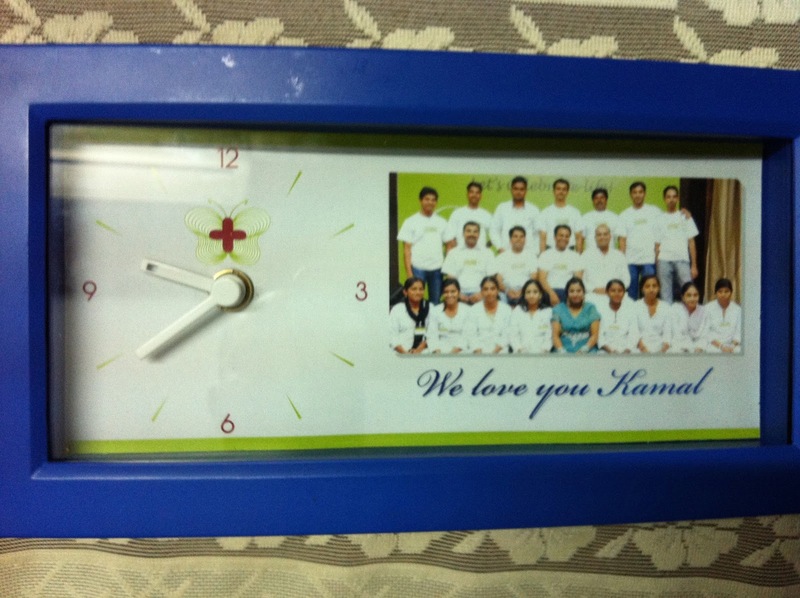 Last year, the NephroPlus team had come home in the middle of the night and surprised me like hell. There was no way they were going to do it again. I mean, who does these kinds of things every year?! I was on dialysis. I fell asleep after a while. Suddenly the light came on. And there they were. The NephroPlus team trooping in one by one. Even Sara and Tabassum, former NephroPlus team mates had come! They brought a cake that I cut while on dialysis. 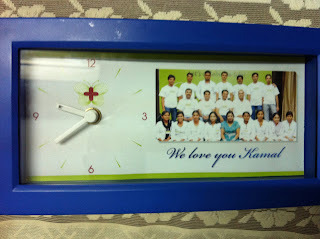 They brought a beautiful clock and some cards. The best part was the videos that they recorded of the patients that dialyze at NephroPlus wishing me. Those were very sweet. There were also videos of the NephroPlus team that couldn't make it at night. I was really touched by Dr. S. Krishnan's video. He is a senior nephrologist of the city. This entire effort was co-ordinated by Sandeep Gudibanda, fellow director at NephroPlus. I will never forget what he did for me that night. I couldn't sleep for almost two hours after they left. The next morning, I went to - where else - Poorna Tiffins, had my fill of Idlis with ghee. After this I went to the Banjara Hills center where the team had decorated a part of the center with balloons and confetti and we had the cake cutting. After this, A Srinivas suddenly called me and suggested that we have lunch together. Sure, I said. When I reached the restaurant, I was surprised to see some other really good friends there. We had a great lunch! That evening I had dinner at my favorite restaurant with my family. At the dinner, I was shown a video by my brother done by Dinesh, Kamal Kumar and their families. These are my friends from engineering college. That video was also so beautiful! Thanks all of you! I thought I was done. Nope. Not so soon. The East Marredpally center team complained that they did not get a chance to do the cake cutting with me. 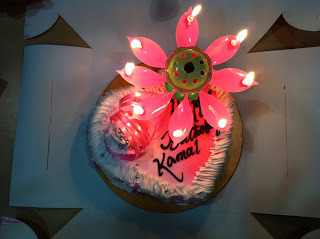 So, next morning, I went to the East Marredpally center and we had another round of cake cutting and general hungama. And now a word about Facebook. Last year, I had this crazy notion that I shouldn't display my birthday on Facebook. Those who remembered my birthday would wish me, I thought. I was so wrong! I am no great celebrity! This year I realized that and changed the settings to show my birthdate. I was overwhelmed by the wishes. Almost 70 people wished me. Yes, it takes very little effort but the feeling that so many people wished me was really touching. People who I have talked to last close to twenty years back. They were wishing me! This is possible only on something like Facebook. This birthday was probably my best ever. So much love and affection. I was moved beyond imagination. Thanks everyone who did this!